Happiness is elusive. Everyone seems to strive for it and is unhappy with the effort and the mixed results. That’s because even if you achieve happiness, it’s only temporary. Happiness can’t exist without its opposite, unhappiness. That brings us to work. Unhappiness on the job feels epidemic. We’re sold on the idea that we should find something we love and then work towards a career doing that. But such logic is deeply flawed. Even if you love eating candy and somehow get a position in an organization where all you do is eat candy, you’re going to get sick. Then there’s also the overarching goal of any company, which is to make a profit, not to make you happy. There’s going to be a conflict there. That doesn’t mean we must resign ourselves to an existence of dread, frustration and meaningless toil (unless you’re into that sort of thing). There are compromises. You can be happier at work, especially if you give up unrealistic expectations. So, if you’re wondering how to be happy at work, then follow a few of these practical suggestions. Work is like a family: you’re stuck together for hours at a time and are constantly bickering and getting on one another’s nerves. Okay, maybe the family metaphor isn’t going to work. However, you can think of work as a community, a place where there are rules of conduct and people treat each other civilly. The worst office is one where you are in conflict with one or more of your coworkers or superiors. According to the Harvard Business Review, having supportive relationships on the job is a key to a happy work environment. Yes, you want to have professional relationships, but you’re not a machine. People need positive, human connections. Reach out to coworkers and colleagues in person, or privately through email or collaboration software. Seek their help, and offer to help them. Be transparent and vulnerable. You can meet after work, carpool to work, play team sports together or whatever it takes to create those bonds. Suddenly, you’re looking forward to going to work because you like the people there. If you’re management, then you have even more power to promote happiness at the office. Don’t force your hand, but do offer employees options that give them opportunities to let off some steam and have some downtime. It’ll make them happier, which will make you happier, especially when you see how productive they’ve become. If your boss is the reason you’re feeling unhappy at work, then your options are a bit more limited. You don’t have the authority to totally change that dynamic, but there are ways to deal with a bad boss. Be pleasant. Do the work without complaint, and volunteer to do tasks when they’re offered. That doesn’t mean you should become a doormat, but kindness can lighten even the darkest heart. That said, if your boss is abusive, don’t take it. Report it. Does life have meaning, or is it absurd and meaningless? Leave that question to the philosophers; you have work to do. Still, feeling that what you’re doing is important and meaningful can make you feel better on a day-to-day basis. Research from Stanford shows the powerful effect meaning has on a person. In fact, “the quest for meaning is a key part of what makes us human,” concluded researchers. That might not lead to bliss, but it will certainly make you happier at work. Instead of seeking hedonistic fixes like overeating, indulging in drink or other ways to avoid your feelings, finding meaning in your labors will let you reach a level of satisfaction that was not attainable previously. But how do you find meaning in your job if you’re flipping hamburgers or doing the equivalent in a white-collar setting? If you’re lucky enough to find employment with an organization that shares your values and is working towards achieving goals that are fundamental to your core ethics, then it will be easy. But if the company is just making widgets, then what? Well, you can get another job. But that’s not necessarily going to cure your ills. Meaningfulness is not always aligned with happiness, at least not with the smiley face variety. A meaningful life can be full of struggle and stress, but if you feel it’s for a larger purpose then you’re going to feel a deeper happiness — maybe not ecstasy, but contentment. All of which doesn’t answer the question of how can I be happy at work in what appears to be a meaningless job? If that’s your situation, then you must find meaningfulness in your actions. Take pride in what you do and how you do it. Be the best you can be. Find meaning in the process, not the product. Take Responsibility for your Happiness! It’d be nice if we just said to the world, “Make me happy,” and the bluebird of happiness flew down and turned our blue mood pink. That, sadly, is not how things work. We need to take responsibility for our own happiness and stop the blame game. Resist blaming your boss, the traffic, the weather and other elements for your own unhappiness. Maybe author Sonia Lyubomirsky has a point. Forbes cites her book, The How of Happiness, as stating that 40 percent of our own happiness is under our control. That’s a pretty good figure, if we consider that the other 60 percent is roughly evenly divided between happy and unhappy. If we can take control of our happiness, at least the percentage we can control, then things might be looking up. How can we do this? Well, there’s the old work-life balance to start. That movement has made some inroads into popular culture with its investments in putting as much work into your well-being as you do into your career. There are more than enough wellness programs that can be sponsored at work or engaged in personally, from yoga and meditation to exercise and hiking. There are people that are more hardwired for happiness and others that are just born with a different disposition. It doesn’t really matter. These are just perspectives. Neither is better nor worse. What’s important is that you know how to deal with your tendencies. Whether you’re a happy, shining person or you’re always followed by a dark cloud, there is something that makes you happy and someway to get it. No less a mind than Socrates said in the dialogue by Plato, Phaedrus, that people must know themselves before they can begin to understand obscure things. Maybe by obscure things he meant that task list your boss insists you do that you hate thinking about. Know yourself, and take responsibility for your own happiness. Then it doesn’t matter where you are or what you do, because you’ll always be the one in charge. Doesn’t that make you feel happy? Want to get an instant happiness fix? 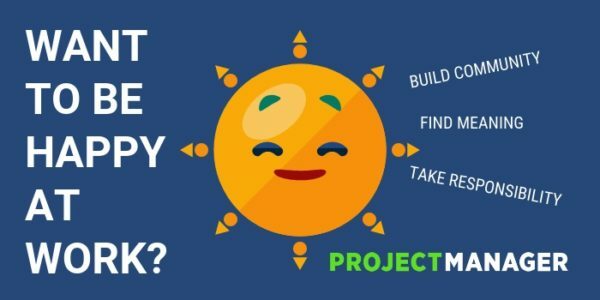 Try ProjectManager.com, the cloud-based project management software. Nothing makes a person happier than having the right tool for the job. Whether its scheduling with our online Gantt chart or monitoring and reporting with a real-time dashboard, project management was never easier. See for yourself, by taking this free 30-day trial.